I love corn. I mean really, REALLY love corn. Off the cob, on the cob, plain, buttered, in a salad or in a soup. I just LOVE corn. As soon as it hits the markets, I’m buy up as much as I can. I eat my fill during the season but the cravings start in early winter. Luckily, I freeze several quarts and put up jars of corn salsa to keep me satisfied until the following summer. Corn chowder is one of my all time favorite recipes, but with the heat we’ve been experiencing this summer, a hot soup isn’t on the top of my list. 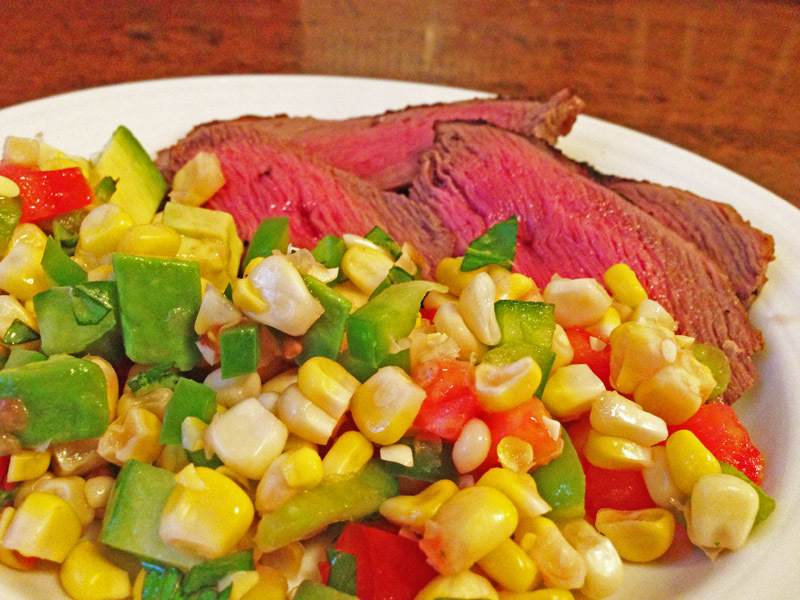 Grilled steak with buttery corn on the cop is an easy go to but sometimes I want to make things a bit fancier. This corn salad is bright with color and flavor, celebrating the summer’s bounty. A touch of red wine vinegar adds a nice kick of acidity and the creamy avocado brings everything together. Toss corn, green pepper, tomato and chopped basil with red wine vinegar and a pinch of sea salt to taste. Gently stir in avocado basil, being careful not to bruise. To serve, grill about a pound and a half of your favorite cut of steak (I LOVE skirt or hanger) medium rare, slice thinly across the grain and divide among 4 plates. Serve with corn salad and enjoy immediately. I love corn especially fresh from the ground. Just made a warm corn sauté with bacon and jalapeño. This recipe looks so fresh! Mmm, bacon…. Generally I freeze my corn in quart size ziploc bags. It’s the perfect size for 2 generous or 4 normal servings. I’m a bit worried this year as corn has been under par. One farmer said it was the combination of cold winter plus VERY wet June, but things should look better in August. Here’s hoping. If I can’t put up corn salsa and at least a few quarts of corn this winter I will DIE. I love fresh corn too…can’t get enough of it! We miss it in the winter! This recipe looks delicious…I’ll have to try it! Do you know what the best way to freeze it is? I cook it in boiling water really briefly. 2-3 mon max. Then plunge it in ice water to stop the cooking. I let it dry completely, cut it off the cob and pack tightly in quart size freezer bags. Hope that helps! I love corn! What a great idea to use it as a salad with steak. Yummm! Happy SITS Day! Thanks. It was almost better the next day. Almost. We sliced the extra steak super thin and tossed it all together in a bowl in the fridge for the next day’s lunch. The flavors blended together beautifully!